A low profile solution packed full of fun! At 7'10" tall this Fun House Combo is great for areas that might not have the overhead room. It's perfect for ceilings under 10' of clearance such as, any indoor area, shelters, garages, and even backyards. Young guests will come flocking to spend time in the jumping area, shoot some hoops or challenge each other through the pop-up obstacles. An always entertaining climb and slide rounds out the combo fun. Large netted vent windows all around, give spectators and parents a clear view of the activities inside.The bright primary colors will attract the attention of all your guests for any event. 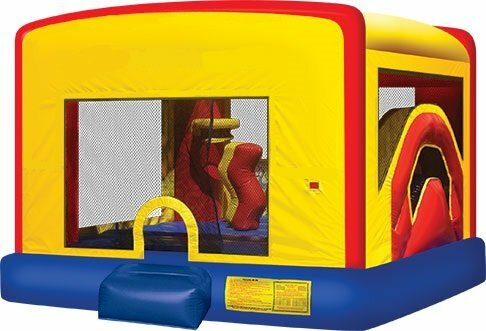 Reserve Fun House Inflatable Combo Today!